These are articles on, or subsequent to, the Inquiry into Teacher Librarians. Articles leading up to the Inquiry can be found under Using the Media. See also articles by Hubbers under Publications. 30 May 2012 Interview with Georgia Phillips, June Wall on ABC Gold Coast Drive with Bernadette Young. Books vs e-books and the need for TLs. Also in Port Stephens Examiner. 13 March 2012 Letter to the Editor from Sharon McGuinness, Sydney Morning Herald. Principal autonomy. 13 March 2012 Toni Leigh interviewed on Brisbane ABC by Steve Austin. School Libraries Under Threat. November 2011 Australian Education Union, South Australia, Journal, “Just what is going on with school libraries?” by David Smith. 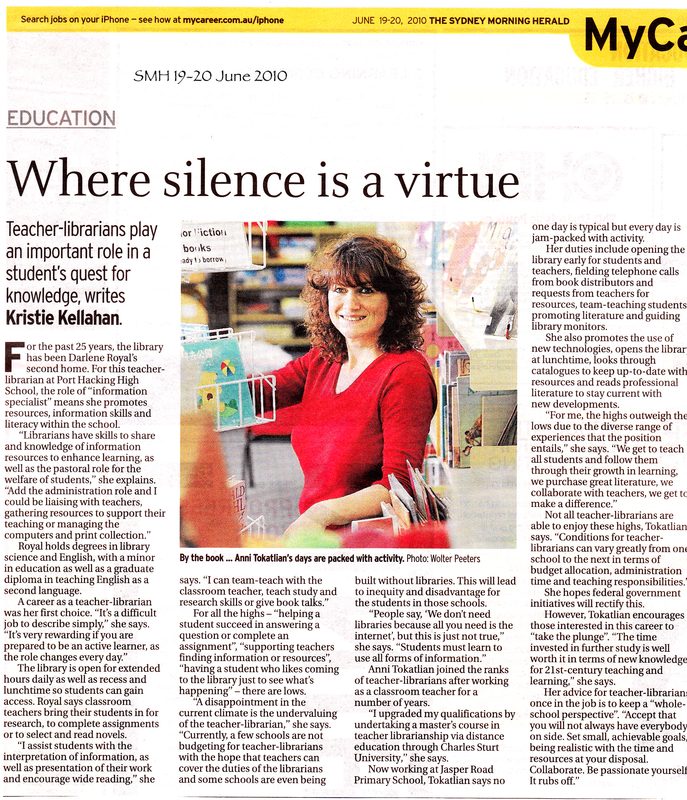 16 November 2011 West Australian, “New library ‘without a teacher librarian‘” by Bethany Hiatt. 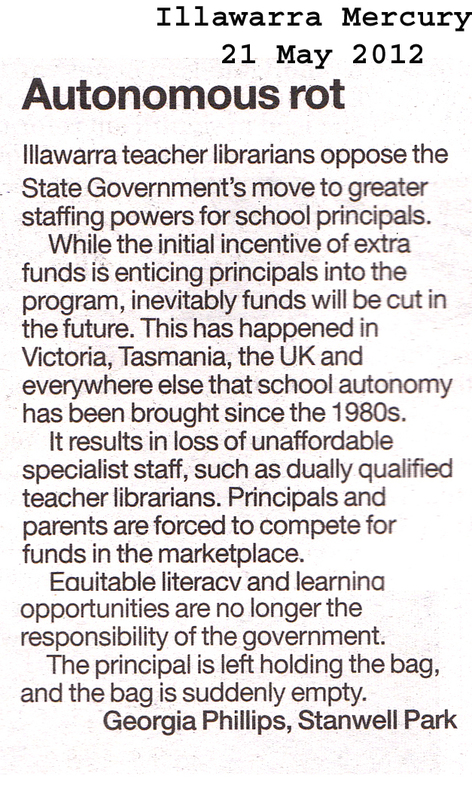 14 November 2011 Hobart Mercury, “State Schools Lack Crucial Staff” by Michelle Paine. 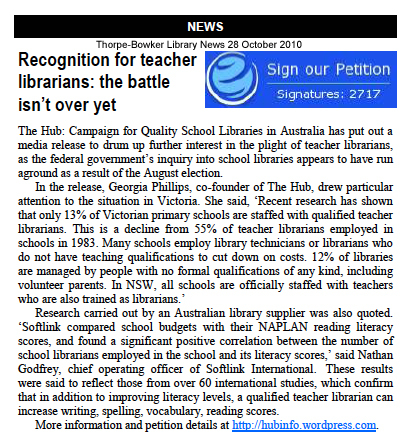 22 September 2011 Education Review, “Teacher Librarians Step Up Campaign” by Natasha Egan. August 2011 House of Representatives About the House Magazine on TLs and the Inquiry A friend in need Crossing the Learning Threshold by Geoffrey Maslen. 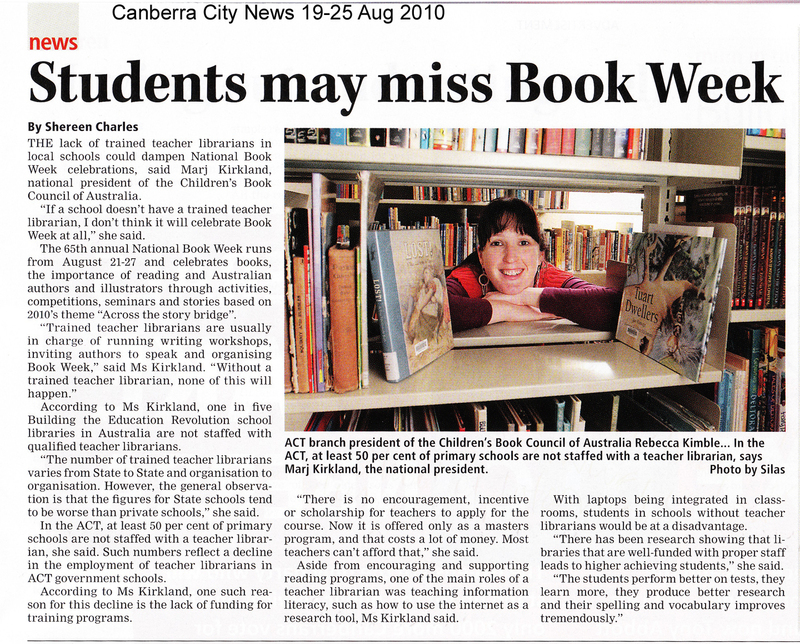 28 July 2011 Archived: Teacher Librarians Fear for their Future by Breanna Tucker in the Canberra Times. June 2011 Education Review “TL report a good start, says sector” by Darragh O’Keefe. 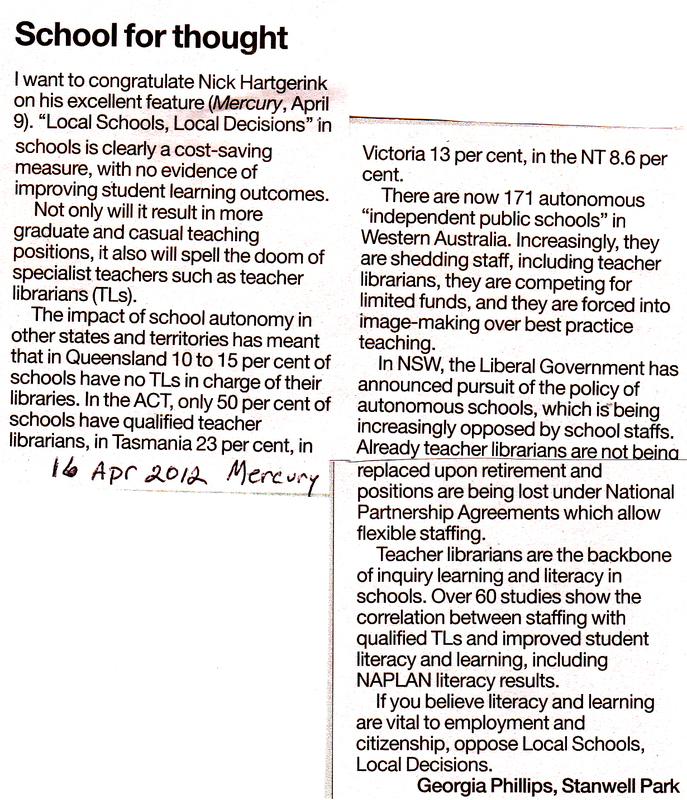 27 June 2011 NSW Teachers Federation Journal Education “‘Valuable contribution’ acknowledged” by Lenore Hankison. 24 May 2011 Sydney Morning Herald “We’re not dragons in pearls, we’re just misunderstood” by Dan Harrison and Kim Arlington. 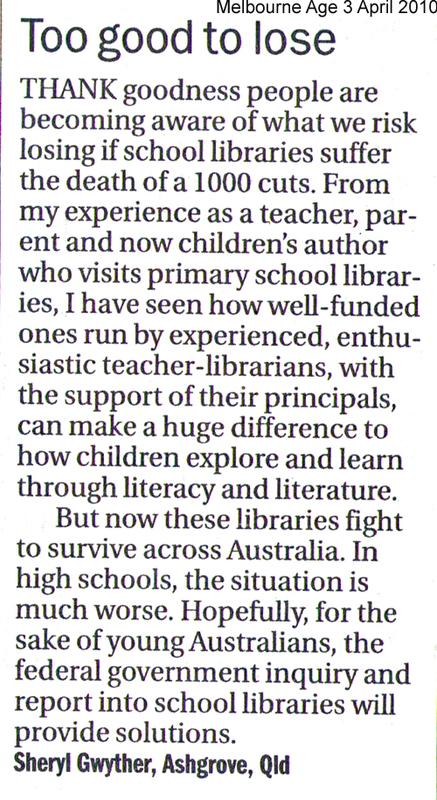 Here is the “same” article from The Age: ”Dragon Librarians Come Out Fighting” and another Fairfax paper, The Illawarra Mercury, recycles the same article as “School Librarians Left on the Shelf: Report.” The same Herald article appeared in the Courier Mail. 23 May 2011. Australian Teacher Magazine. School libraries and teacher librarians report released. 24 June 2010 Australian Teacher Magazine. Teacher librarians vanishing. 17 June Sydney Morning Herald “Nice shelves, pity no books” by Dan Harrison. 3 June ABC Radio National Life Matters. Richard Aedy interviews ASLA Exec Offcr, Karen Bonano. House of Representatives media release on Inquiry: How important are school libraries? A line from Rosemary Sorensen in her Overflow column, The Australian, 17 April 2010. 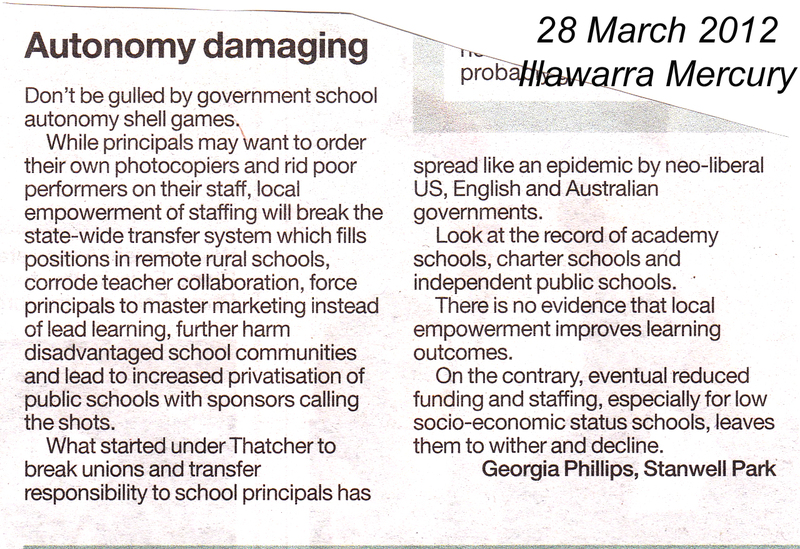 Pine River (QLD) Press, “Shortage set to hit schools” article by Miranda Forster, 16 April 2010. 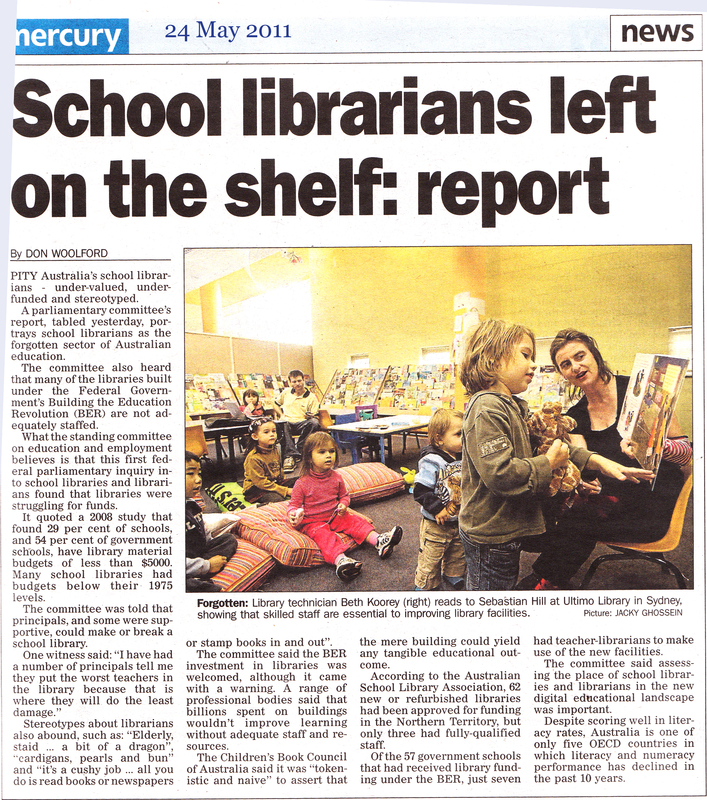 The Adelaide Independent Weekly School Libraries Inquiry coverage by Farrin Foster, 12 April 2010. The Australian Council of State School Organisations (ACSSO) has issued a Special Edition on the School Library Inquiry to all government school parents and friends/citizens groups Friday 8 April 2010. An overhaul of the school librarian’s role that would see them become part of the teaching process is under consideration. The idea of “teacher librarians” – which comes from Australia – is being examined as part of a review by the School Library Commission. The role, which involves librarians also being trained in pedagogy and classroom techniques, entails them working across all curriculum areas and collaborating with teachers to help students become independent researchers. Making librarians’ role in children’s learning more explicit could be one way of improving their status among unconvinced headteachers, campaigners have argued. Alan Gibbons, children’s author and organiser of the Campaign for the Book, has called for school libraries to be made statutory. “The outcome of a school library should be about raising standards, pupils’ well-being, literature and learning in general; the fact that the library is not just an adjunct to the English department,” he said. Sue Shaper, of Broxbourne School, Herts, is a chartered librarian with a masters degree in education. She is researching the state of school libraries for the Chartered Institute of Library and Information Professions. “There is a really wide spectrum, from people with a professional librarian qualification and masters degrees to someone working 15 hours a week without even O-Levels,” she said. “Students across the country are not getting an equal offer. Even since we started the research in December, the picture has changed as far as schools making librarians redundant. There is a threat from the credit crunch. The commission was set up by the Museums, Libraries and Archives Council and the National Literacy Trust. It is being chaired by Baroness Morris, former secretary of state for education. Australia’s education minister Julia Gillard has just announced an inquiry into the future of school libraries and teacher librarians in the country. A committee of politicians will review and report on issues including the potential of libraries and librarians to improve education and factors influencing recruitment. During the 1980s, teacher colleges and universities in Australia developed specialist courses to train people as teachers and librarians. The role involves working across all curriculum areas and in collaboration with teachers to help students become independent researchers. 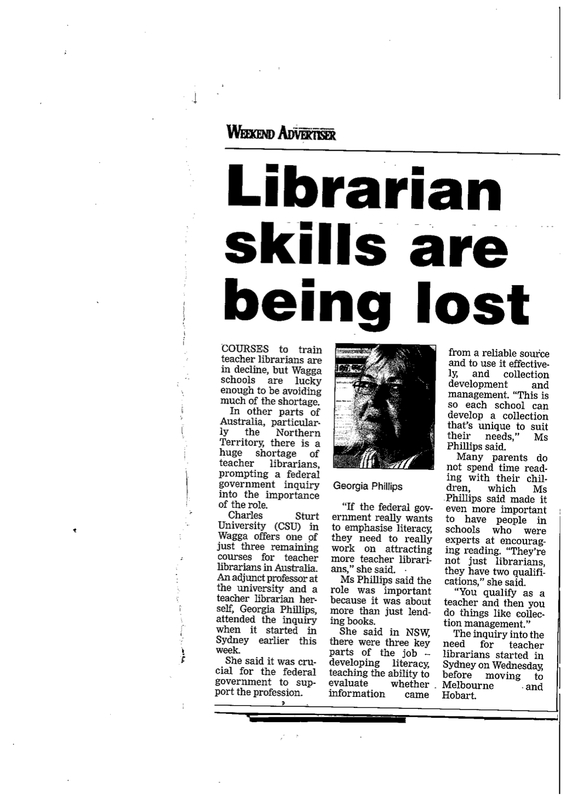 However, following cutbacks in the 1990s, a survey in 2001 found some libraries were staffed by people who had qualified only as teachers, or had no training. The current inquiry comes after campaign group The Hub, begun by teacher librarians, claimed that libraries were facing a crisis – and that the situation in most government schools was dire. It called for “adequate and equitable” funding across all states and territories. I am surprised that we need an inquiry into a school library or in today’s terms an Information ResourceCentre. Teacher librarians, who are trained in the management and teaching of information literacy are facilitators in an information revolution. A google society requires an information specialist to teach our young generation how to best access data bases so that the information that they retrieve from electronic sources are authorative and credible. Who will take responsibility for teaching students how to sift through the mass of information available at the tap of a fingertip? Who will take responsibility for creating an electronic literate society as well as preparing the future generation with a substantial knowledge and interest in reading the magical fantasy , adventure found in books . Information specialist, who have studied information literacy at university are the teachers who work in our school libraries. Well, certainly in the Independent Sector of education. These specialists take the responsibilty for teaching students how to access, evaluate, interpret and organise information retrieved from electronic sources. Without these institutions and these incredible teacher specialist, who have spent many years studying at university , our students and their future in a world that is saturated by technology will be endangered!